RW-2050-A125 is a carrier-class radio that belongs to the RADWIN 2000 A 25M Series and supports 4.9 to 5.8 GHz frequency range. The Radio complies with FCC/IC regulations with a factory default of 5.8 GHz FCC/IC. RW-2050-A125 delivers up to 25 Mbps throughput and up to 4xE1s/T1s over an extended range. 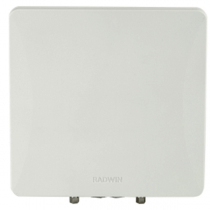 RW-9721-5158 is a high performance Dual Polarization-Directional antenna, 5.6 deg. beam-width, supports 4.9 – 6.06 GHz frequency range. RW-5510-9H54 Subscriber Unit (HSU) provides high capacity access connectivity of up to 10 Mbps net aggregate through put.RW-5510-9H54 supports 4.9 to 5.9 GHz and complies with FCC/IC, WPC, Universal & MII regulations. The radio comes with an integrated antenna. RW-5AB5-9654 is an AIR series beamforming sector Base Station radio unit (HBS). It provides 250 Mbps net aggregate throughput while delivering access connectivity for up to 64 Subscriber Units (HSU). RW-5AB5-9654 supports 4.9 to 5.9 GHz and complies with Universal, MII & FCC/IC regulations. default: 5.4 GHz ). The multi-band radio is part of the RADWIN 2000 A-Series that delivers 25Mbps throughput and extended range. 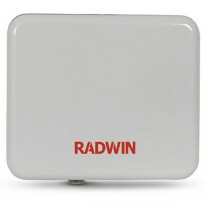 (up to 4XE1/T1 plus Ethernet) RADWIN RW-2954-A125 comes with an integrated antenna.